In contrast to people-first language, identity-first language describes the person as "disabled". 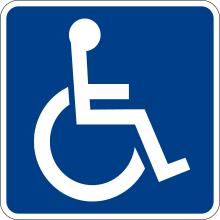 Some people prefer this and argue that this fits the social model even better than does people-first language, as it emphasizes that the person is disabled not by their body, but by a world that does not accommodate them. ^ "Person-first and identity-first language: Developing psychologists' cultural competence using disability language". NCBI. NCBI. Retrieved April 24, 2019. ^ Piecek, Monika; Perrin, Céline; Tabin, Jean-Pierre; Probst, Isabelle (January 17, 2019). "The 'compliant', the 'pacified' and the 'rebel': experiences with Swiss disability insurance". Disability & Society. 0 (0): 1–24. doi:10.1080/09687599.2018.1545115. ISSN 0968-7599.